Card Buffet Class at Scrapfest! Scrapfest in Kitchener, Ontario yesterday was awesome! Over 40 vendors, nationally and internationally renowned instructors, a huge crop area, fabulous! I mean think about it, how much $ can you lay down at ONE STORE!? Can you IMAGINE OVER 40! Woooow! 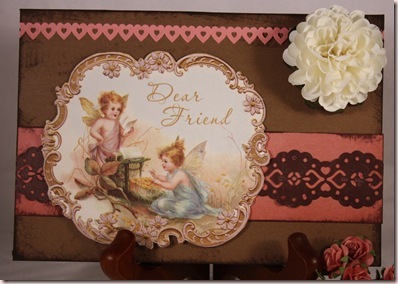 I signed up for a card buffet class taught by Trisha Ladouceur; she is a hoot! This type of class is quite new; you sit down in a room with various tables set up with oodles of supplies. Cardstock and patterned paper on one table, ribbons, fibres and brads on another, masks and Tattered Angels Glimmer Mist, punches, stamps, Primas and other flowers, Class-A-Peels and Sakura (Soufflé and Glaze) pens, chipboard-you name it, there was a table full of it. Only rule? Make one card at a time, no assembly line production. That being said, if you were waiting for the Glimmer Mist to dry on one card, you could work on another. 2 hours of make ‘em as fast as you can! For me, it was a bit disconcerting because I like perfect mats and take ages to decide on one embellishment. My average card takes about an hour or a bit more. I soon got into quick mode and it was delightfully freeing! I did only get 4 cards done but I have bits and bobs I painted or sprayed but didn’t use so I can build a couple more using those pieces. $40 seems a lot to pay for a class where I made just 4 and a bit cards but the fun of it made it more worthwhile than just 4 cards worth of supplies. Some people didn’t like the class because they are used to being provided with every step of every card but the description did warn you that the class was freeform. I’ll show the other 3 cards this week sometime. A couple of things weren’t perfect, the cards provided were only white and ivory with limited colours of cardstock to cut and score your own card bases and to use for mats and layers. The teacher felt there were lots of stamps, however to me the supply was extremely limited with about 10 sets and maybe 20 singles. And no backgrounds! It was frustrating to have such cool stuff at home I am used to using that simply wasn’t there. And she lost the foam dots and glue dots until class was over! Ooops! Playing with the Glimmer Mist and masks was fun. I have a gold mist of some kind (forget the brand) but I have only used it for all over shine, not using a mask! Very cool. I bought some masks and two shades of brown GM and I can’t wait to play. YOU MAY HAVE HAD ALL THE STAMPS YOU WANTED, BUT YOU CERTAINLY MADE A BEAUTIFUL CARD.